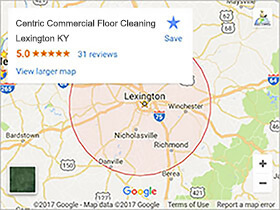 Centric Commercial Floor Cleaning provides a wide variety of commercial floor cleaning services tailored to the commercial, institutional, municipal, and business community through out all of Lexington and Central KY. 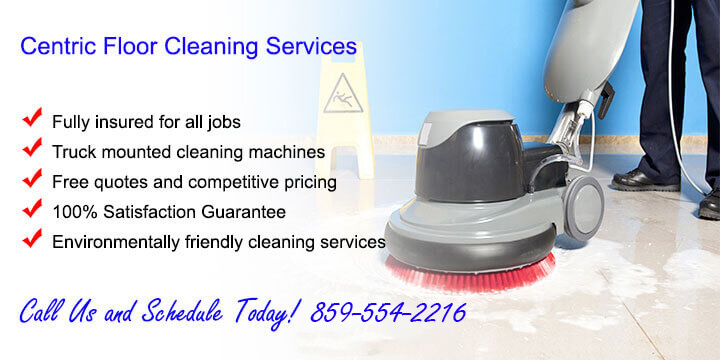 Hiring a professional floor cleaning service has plenty of economic benefits. With our trained technicians and truck mounted floor cleaning equipment we’re able to clean twice as much in half the time! Which means it would take you four times as long to clean as it takes us! With our competitive rates, we’re saving you time, headache & money! Our total service area encompasses Lexington, Nicholasville, Georgetown, Richmond, Frankfort, Versailles and Winchester KY. Floor Buffing and Polishing: Our floor buffing and polishing machines can extract difficult to remove dirt and our waxing process leaves floors with a shining top coat. 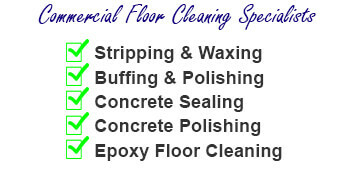 Concrete Floor Cleaning & Polishing: Concrete floors cleaned to perfection. Our services also include resurfacing, grinding, leveling, and concrete polishing up to a mirror finish if desired. Floor Stripping and Waxing: We provide full service commercial and industrial floor stripping & waxing services for any of your needs with a focus on ecosafe practices. Hardwood Floor Cleaning: Our wood floor cleaning process leaves home and business owners with a floor that is clean and sealed to perfection. Call us for a free quote on your wood floors. Cleaning decorative concrete surfaces seems easy at first, but some chemicals can actually be harmful. Centric uses the right chemicals and a soft pressure cleaning technique to ensure that the process is done properly. We love to maintain relationships with clients and become more than just a floor cleaning service. We want to be part of the routine that makes your life better, healthier, and cleaner. And, the more often we come by, the less work we have to do, and the more you save. Not to mention the intangible benefit of living or working in a spotless place!